詳細: Syl will pay you to find and protect her companion Brink. You should be able to find him in the Ember mine. 詳細: Find the Overseer's Library, Syl believes it may contain information that can cure the Ember Blight that infects your body. 詳細: You need to find the Ember Forge. Follow Syl down the stairs. 詳細: Retrieve the three destination glyphs, one from each rune gate. With the glyphs, Syl will be able to open the final rune gate. 詳細: Syl has opened the portal for you to continue to look for the Ember Forge that should be able to cure you of the corruption that you received when attempting to save Brink. 詳細: Torchlight and the mountain below it are experiencing strange earthquakes. Syl has asked you to find the cause before the town collapses. 詳細: You must path through the lava prison to get to the Ember Forge. Defeat the goblins and gain access to the Dwarven fortress. 詳細: Search the Dwarven Fortress for the Ember Forge that can cleanse your corruption. 詳細: Alric has captured Syl. Descend further and rescue her. 詳細: Pursue Alric deeper into the palace. 詳細: Confront Arlic and prevent the Ember blight from consuming Torchlight. 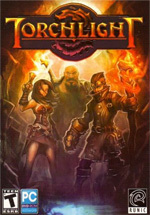 Q: What sort of quests will Torchlight have? A: Completing the main storyline takes about 10 to 20 hours. The main dungeon has over 30 levels, composed of seven distinct tile sets.